Students at Oak Ridge Elementary were being hastily dropped off on Thursday as the first bell of the day was about to ring. 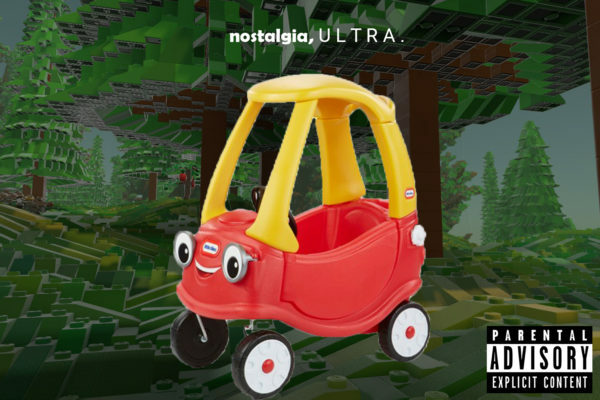 Parents scurried to drop their kids off for another day of school. As parents turned out of the drop off lane, they drove past dozens of teachers who were not in their classrooms, but instead, on a narrow strip of sidewalk in front of the school, pacing back and forth. They held picket signs and cups of coffee, with a big message for the Sacramento City Unified School District: “enough is enough”. A woman with her sign urging the school district to “Cut from the Top”. Her message is similar to other slogans the teachers union repeated at the rally like “honor the contract, obey the law”, “when we make promises, we keep them”, and “when we fight, we win”. 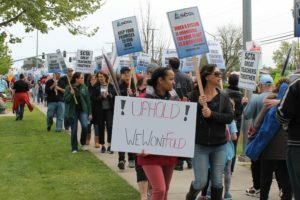 Oak Ridge teachers and staff members joined educators across the city for a one-day teacher’s strike aimed at having the district honor their contract. In 2017, Sacramento City teachers were threatening to strike if the district was not willing to reduce classroom sizes along with increasing student resource services and teacher salaries. 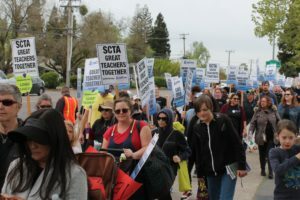 Two days before the planned 2017 strike with the help of Mayor Darrell Steinberg, the Sacramento City Unified School District (SCUSD) and the Sacramento City Teachers Association (SCTA) came to a deal to raise teacher pay by 11%. 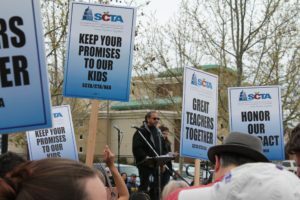 Salary increases were part of the SCTA’s goal to bring Sacramento teachers salaries on par with surrounding school districts. For the 2017-2018 school year, the average teacher pay for a SCUSD teacher was $73,236. Neighboring school district Elk Grove Unified, on the other hand, had an average teacher salary of $80,261. The San Juan and Twin Rivers school districts had teachers wages of slightly over $76,000. The district and teacher’s union agreement retroactively raised teacher salaries by 2.5% for the 2016 and 2017 school years. The plan also stipulated that teachers would receive a salary increase of 2.5% in 2018 and a 3.5% increase for 2019. While the wage increase is being upheld by the school district, the teacher’s union is arguing that other provisions of the contract are not being honored by the district. 6th grade teacher Dekeithi Walton was the spokesperson for the Oak Ridge faction of strikers. Parents and kids alike showed up to support their teachers. This mom and her kids were equipped with some homemade signs. Dekeithi said that while he has many issues with the administration, today’s strike was about one thing. Heather Mains has been working in the Sacramento City Unified School District for 11 years now. She is a speech therapist and special education teacher who has been an educator at Oak Ridge Elementary for the past 2 years. 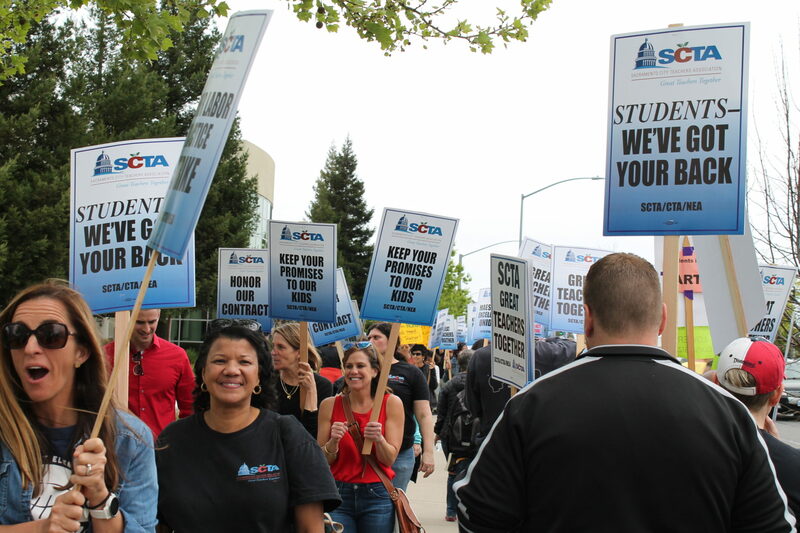 Strikers picketing up and down 47th Ave, in front of the SCUSD Headquarters. While Mains was happy about the wage increases the 2017 contract afforded to teachers like herself, she also wants money to be directed towards more funding to bolster the few resources available to students. “Today we are here because we came to an agreement that we’re going to renegotiate our healthcare that we have so, as the administration would say, a more ‘fiscally responsible’ type of health care. We agreed to that with the understanding that the money that we would be saving with the new health care would go back into the schools. Now they are saying they are going to take that excess money and bail them out of this bankruptcy that we are in that was caused by them completely overspending. People have gone on massive vacations with this money. The administration salaries have bloated. Our superintendent is one of the best paid superintendents in California. The jobs that they created in the district, as far as administrators, have grown and grown and grown and grown. So it’s really top heavy. Meanwhile our class sizes are huge and our students don’t have the resources they need”. Many of the picketers were students, parents, union members, and labor activist who wished to show solidarity with the teachers. 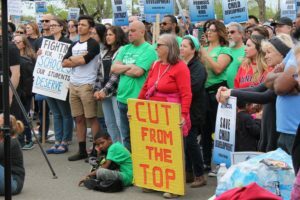 Last September, the county Board of Education rejected the proposed budget plan by Sacramento City Unified for the first time. The board cited the district’s $35 million budget gap and continued annual deficits as the reason the budget could not be ratified. 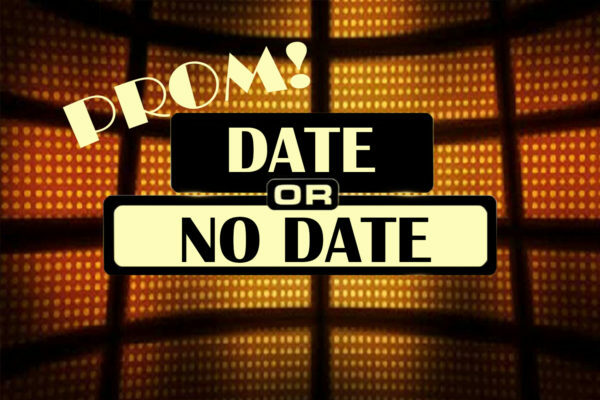 In the six months since, a budget proposal has not been approved and the district faces a state takeover if no proposal is passed by June 20th. The school district proposed to solve the debt crisis and the possible threat of a takeover by moving health care savings into the debt hole. The teachers strike rejects the school district’s plan. 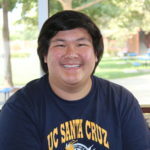 Instead they want the $16 million of savings in health care cuts to go towards student services. 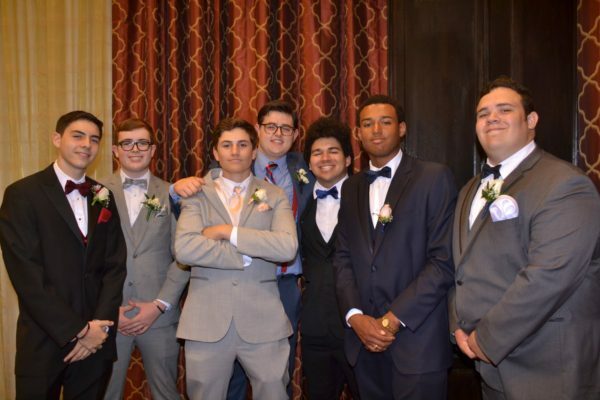 The union hopes to reduce the budget crisis by cutting mismanagement and unnecessary cost within the upper echelons of the administration. These proposals come at a troubling time for the SCUSD, as the district is facing a looming financial crisis. $16 million: reducing central office administrators to the 2014 levels. $6 million: eliminate the vacation buyout for admins and others. $16 million: change to a less costly healthcare plan. $600,000: reduce admin pay to more reasonable levels. $1.2 million: reduce the use of outside attorneys for labor relations. $12.5 million: redirect retiring health care insurance overpayment. $4.2 million: terminate third party contracts for language, speech, hearing, and nursing, and restore other positions along with additional smaller cost saving practices. Kindergarten teacher and president-elect for the CTA Toby Boyd urges the school district administration to honor the contract. 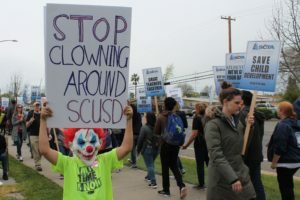 The SCUSD administration rebuked the teacher’s union’s claims that the central office of administration is too top heavy. They cite California Department of Education data that shows that 4.4% SCUSD’s general funds go towards administrative cost, whereas neighboring school districts pay on average 5.7% for their administrative needs. The administration, however, does not deny the other $44 million in cost saving proposed by the SCTA. 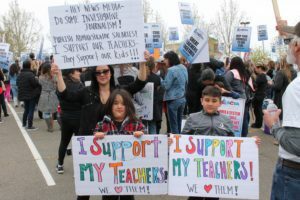 Hundreds of teachers, school staff, parents, students, and avid supporters converged outside of the school district’s headquarters on 47th Avenue and Stockton Boulevard. The 12 P.M. rally was well organized with packaged meals, cases of water, a line of port-a-potties, and picket signs as far as the eye can see. School nurse Julie Davis tells me this is her first time on strike. She is picketing because, despite being very proud to work in this district, “there is definitely room to grow”. In her experience as a nurse, Davis is worried about school nurse coverage and health coverage for kids overall. Ana Jenkins is a nurse and member of the California Nurses Association. Although not a school nurse, Ana believes that solidarity is an important step towards justice for students. A student stands at the street corner as drivers honk their horns in support of the strike. Many students did not show up to school on Thursday, either staying home, taking the day to hang out with friends, or picketing with their teachers. Kennedy High School senior Bernadette Tropel tells me that she fully backs the teachers. While the strike has put a strain on testing and learning soon before her critical AP tests, Bernie “easily” puts more of the blame on the school district.